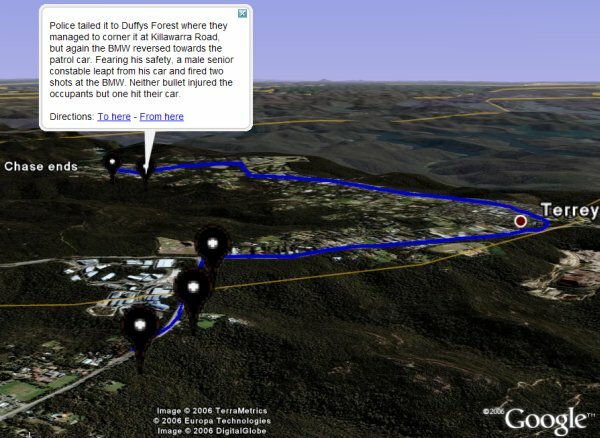 Sydney Morning Herald's Stephen Hutcheon used the easy-to-use Quikmaps to create a map of a convict's drammatic high speed escape attempt (he was recaptured) in his article last week: "Sydney prison escapee rams police". GoogleMapsMania highlighted the story today and laments: "Why don't more news organizations do this sort of thing?". I agree! And, knowing the Quikmaps also supports KML files, here is the same map which you can view in Google Earth. The only problem is that the placemarks are colored "black" and its hard to see them against the dark aerial photos in this portion of Sydney, Australia.